Phillip Boiselle, M.D., a leader in thoracic imaging and innovation, will serve as dean of FAU’s Charles E. Schmidt College of Medicine effective in January 2017. He comes to FAU from Harvard Medical School. 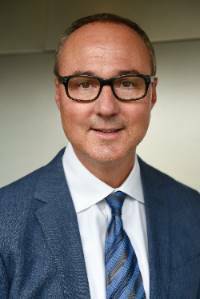 Florida Atlantic University has named Phillip M. Boiselle, M.D., as the new dean of the Charles E. Schmidt College of Medicine. Boiselle, who currently serves as associate dean for academic and clinical affairs, and professor of radiology at Harvard Medical School, and is a member of the cardiothoracic imaging division at Beth Israel Deaconess Medical Center, will assume his role as dean effective in January 2017. He will spearhead FAU’s College of Medicine, one of 141 accredited allopathic (M.D.) medical schools in the United States, which admitted its inaugural class in 2011. Boiselle is poised to build upon the success of the college’s innovative medical student education program and to expand its graduate medical education program in partnership with a consortium of five Palm Beach County hospitals. He also will oversee and build upon the college’s vibrant research focus areas, including neuroscience and healthy aging, two of the key pillars of research strength in the University’s strategic plan. Boiselle graduated from the Duke University School of Medicine in 1990 and subsequently underwent radiology residency training at Yale University, where he also served as chief resident. He completed a fellowship in thoracic radiology at Massachusetts General Hospital in 1996. Following his fellowship, he was appointed director of thoracic CT and assistant professor of radiology at Temple University. In 1999, he joined the staff at Beth Israel Deaconess Medical Center as the director of thoracic imaging and as an assistant professor of radiology at Harvard Medical School. In this role, he developed and led a nationally recognized division that also was highly valued locally for its emphasis on quality and safety. This emphasis led to his subsequent appointment as vice chair for quality and safety, a role in which he led a variety of initiatives to improve safety, productivity, quality and efficiency. Boiselle’s educational leadership experience has been fostered by formal training as a Rabkin Fellow in Medical Education at Harvard Medical School. He has held a variety of local, regional and national educational leadership roles, including director of pre-clinical radiology education, radiology residency program co-director, thoracic imaging fellowship director, president of the New England Roentgen Ray Society, and president of the Society of Thoracic Radiology, among others. His research focuses on the application of advanced airway imaging methods, including 3-D external reconstruction and internal "virtual" bronchoscopic techniques, to a variety of benign and malignant airway disorders. Boiselle has achieved international recognition as an innovator in his field, which has led to significant external research support through National Institutes of Health (NIH) funding. His clinical expertise and innovations in non-invasive airway imaging have been achieved by successfully combining his translational research and teaching in this area to enhance the ability of radiologists to diagnose a variety of central airway abnormalities non-invasively with CT with similar accuracy to conventional bronchoscopy. Boiselle also served as an investigator for the National Cancer Institute (NCI)-funded National Lung Screening Trial, a randomized control trial that was the first to demonstrate the ability of CT screening to reduce lung cancer mortality. Since the completion of this trial, he has played a national role in guiding the successful implementation of high-quality lung cancer screening in community and academic settings. In May 2012, Boiselle was appointed associate dean for academic and clinical affairs at Harvard Medical School. In this role, he has provided oversight of the school’s research and educational centers, faculty development and diversity initiatives, and affiliation agreements, among other activities. Boiselle is a fellow of the American College of Chest Physicians and a member of the Society of Thoracic Radiology, the Fleischner Society, the Radiological Society of North America, and the American Roentgen Ray Society, among others. Boiselle has published numerous educational and research articles, as well as five textbooks, including “Case Review: Thoracic Imaging,” an internationally recognized resource for resident exam preparation that has been translated into several different languages. He also has served as the editor-in-chief of the Journal of Thoracic Imaging since 2009. He has numerous honors and awards to his credit including being named a Rabkin Fellow for Medical Education at Harvard Medical School in 2003, receiving the Robert E. Lenkinski Award for Excellence in Academic Radiology Mentoring, and receiving the 2012 Radiological Society of North America Honored Educator Award, among others. Boiselle officially begins as dean on Jan. 3, 2017, after he has completed his administrative, teaching and service obligations at Harvard Medical School.